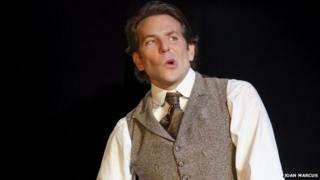 Image caption Cooper has said watching the film of The Elephant Man "solidified [his] need to become an actor"
Oscar nominee Bradley Cooper has revealed he has to hang upside down on an inversion table to straighten his back after playing Joseph Merrick on stage in The Elephant Man. Cooper plays the physically deformed Merrick by contorting his body rather than using prosthetics. He told BBC Radio 4's Front Row that twisting his features had left one side of his face bigger than the other. "Right now my face twitches sometimes," he said. The play is transferring to London after a successful run in New York, and Cooper said that having experienced back pain during the New York shows, he had brought his table with him. He distorts his body for the role and appears on stage virtually naked. "It's all about illusion," he said of the play, written by Bernard Pomerance in 1977. "The physical challenge is having to twist body and hold it for two hours. It's brutal, we did 120 performances in New York and in the last two weeks of the play I started to feel it in my back and my mouth and my face, all the muscles got very strong. "This side is bigger, I don't know what's going to happen [in London]. I do worry a little bit, I'm not going to lie," he laughed. He said that the inversion table has been "amazing for my spine". "You lie on it and then like a bat you turn over - I have it where I'm staying. You do that morning and night and then find a person who can do massage work every day." The actor joked that he experienced pain because, aged 40, "I'm not a young man." The story of John Merrick also inspired David Lynch's Bafta-winning 1980 film, which starred John Hurt. Cooper told the BBC he was first inspired to become an actor after seeing Hurt's performance. "There was something about the way he lived his life, the curiosity, the levity he had. Given all of his physical afflictions, it was mesmerising to me in a cinematic form, in a physical form, and it made me think 'I want to tell stories like this,'" he said. US critics have raved about Cooper's performance as Merrick, following on from his three Oscar nominations for American Sniper (2014), American Hustle (2013) and Silver Linings Playbook (2012). Despite the pain he endures on stage, Cooper said that the most physically demanding role he has had was as Chris Kyle, a US military sharp-shooter, in American Sniper. He had to pile on "40lb of primary muscle" and bulk up by eating "all protein, no fat, no sugar - it was not fun eating 6,000 calories of healthy food each day", he said. Cooper is among many actors who have faced physical challenges for their roles. Actor Hugh Laurie, who starred in US hit series House, complained that playing the limping title character was playing havoc with his knees; while Matthew McConaughey has spoken of the pain of having to lose 47lb to play Aids patient Ron Woodroof for 2013's Dallas Buyer's Club. Christian Bale lost 60lb to star in The Machinist in 2004, only to bulk up six weeks later to play Batman. Directed by Scott Ellis, The Elephant Man will play at the Theatre Royal Haymarket until 8 August. Cooper is interviewed on BBC Radio 4's Front Row at 1915 BST.